Western blot analysis of extracts from 786-0, HeLa, and HCT 116 cells using Frizzled6 (D16E5) Rabbit mAb. Western blot analysis of extracts from HeLa cells, transfected with 100 nM SignalSilence® Frizzled6 siRNA I #6596, 100 nM SignalSilence® Frizzled6 siRNA II #6597, or mock transfected, using Frizzled6 (D16E5) Rabbit mAb (upper) or β-Tubulin (9F3) Rabbit mAb #2128 (lower). 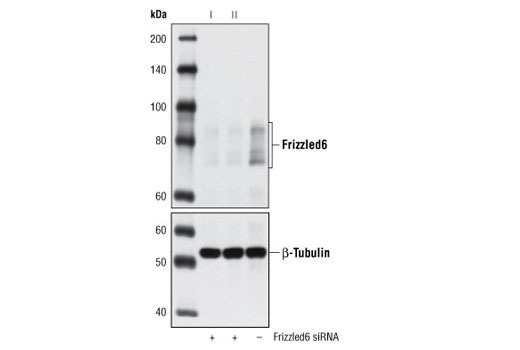 The Frizzled6 (D16E5) Rabbit mAb confirms silencing of Frizzled6 expression, while the β-Tubulin (9F3) Rabbit mAb is used as a loading control. 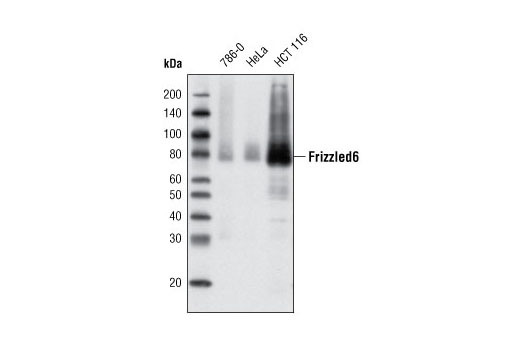 Frizzled6 (D16E5) Rabbit mAb detects endogenous levels of total Frizzled6 protein. Monoclonal antibody is produced by immunizing animals with a synthetic peptide corresponding to residues near the carboxy terminus of human Frizzled6 protein.